Erica and I once again became interstate travelers as we braved some of the worst traffic I've ever seen to make it down to the Richmond Zinefest, a two-day affair this year and held in a new location. We were there primarily to table for my wife's distro, Black Light Diner, but I was also looking forward to grabbing new mini-comics and zines and getting to hopefully talk to a few comics folks in the Richmond area. The event was held at Gallery 5, a local art and performance space and was featured as part of a First Friday event that occurs in the area. I have to be honest, sitting at a table with precariously positioned paper objects while people walked around with their beers and wines sloshing made me a bit nervous. Unfortunately, it seemed liked that was also where all the spare money was going, because there wasn't a lot of people walking around with zines under their arms. This was not for lack of picking up things and reading all the way through before moving on. (I try really hard not to do that. If I do, I usually end up buying something, I just need time to decide what.) Oh well. Saturday was better and made the trip worthwhile--the day featured much less walk-in traffic, but those who showed up were far more inclined to stop and talk and buy something. (Friday's music was so loud it was almost impossible to hear anyone.) I made a few stops around in the afternoon, as did Erica, and we grabbed quite a few interesting zines and comics that I hope to read and review soon. I felt like there was a bit less tabling this year from last year, but that might just be because we were on two different floors. Some of the folks were either at the Philly Zinefest or SPX, and we had a wonderful time sitting next to Joseph Carlough who does Today Terrific. (He has a drawing from me of a girafffe on roller skates that may or may not see the light of day.) I'd say the mix of comics and print zines was fairly balanced, which I personally like but I wonder how those who have a longer history in zines feel about that. 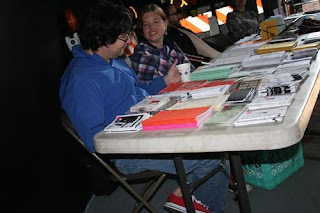 As with the Philly Zinefest, Erica did well and the hired help (me) had a good time. It seemed like the others around us were also enjoying themselves and people walked out with quite a few zines of all kinds, which is the point. On a personal level, I was quite pleased to get to talk to Chris, of Adhouse Books, for a few minutes as he stopped by the fest. I was also able to talk about all things Pittsburgh with Rob Ullman, who I had no trouble recognizing--he's the only guy in Richmond wearing a blue Pens shirt. Richmond Zinefest is a delightful excuse to get down to Richmond, a very lovely city with a great used book store, some fun comics people, and on a personal level, a few friends as well. If possible, we'll try to be there again next year. If you live near Richmond, definitely plan to stop by and pick up a comic or two. Just please don't spill your beer if you're drinking that night, okay?